E-Book Piracy: The Publishing Industry's Next Epic Saga? As e-readers such as the Amazon Kindle continue to rise, so follows the publishing industry's worst nightmare: e-book piracy. For years e-book piracy was the exclusive province of the determined few willing to ferret out mostly nerdy textbook titles from the Internet's dark alleys and read them on their PC. But publishers say that the problem is ballooning as e-readers grow in popularity and the appetite for mainstream e-books grows. "We are now seeing large volumes of e-books being pirated on everything from file-sharing networks to Websites," says Ed McCoyd of the Association of American Publishers, a trade organization representing major U.S. book publishers. The year-to-year percentage growth of available e-book titles is unknown, McCoyd says. Other publishers, such as Hachette Book Group, say that e-book piracy has grown "exponentially" over the past year. A review of e-books currently available for illicit download confirms that e-book piracy is no longer dominated by technical how-to e-books but includes best-selling authors Janet Evanovich, John Grisham, and James Patterson. PCWorld found that one-third of Publishers Weekly's 2009 top 15 best-selling fiction books were available for illicit download through a growing variety of book-swapping sites, file-sharing services, and peer-to-peer networks. The availability of best sellers is just the start. PCWorld discovered virtual bookshelves stuffed with pirated e-book titles ranging from copyrighted popular fiction and nonfiction titles to college textbooks and how-to e-books. All of these titles are downloadable and ready for viewing on your e-reader of choice, be it the Amazon Kindle, Sony Reader, or Barnes & Noble Nook. "We know e-book piracy is a problem, and we are taking the issue very seriously," says Paul Aiken, executive director of The Authors Guild, an advocacy group for writers. "We've seen the music and film industry deal with this, and it stands to reason we will grapple with it too." Aiken says that while he is concerned about the growth in the availability of e-book titles on the Internet, he is not convinced that the number of people who are actually downloading the digital files is increasing as rapidly. Compared with music piracy, illicit e-books are not nearly as widespread or as easy to acquire. Pirates must be determined to track down specific e-book titles. Pirated e-book files (usually available as PDFs) can sometimes be poorly reproduced, and are sometimes made up of scanned page images--not text. Worries of piracy have kept many publishers and authors, most notably J.K. Rowling, author of the Harry Potter book series, from embracing the e-book format. 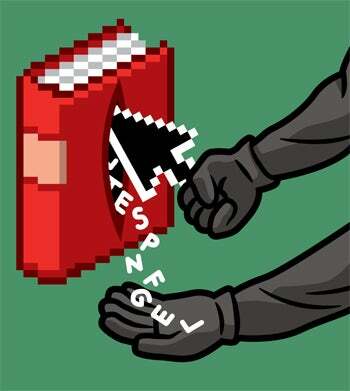 They fear that e-book files protected by digital rights management (DRM) technology could be hacked anyway. However, refusing to take advantage of the e-book format can sometimes backfire and drive piracy, says consumer technology analyst Rob Enderle of the Enderle Group. For a relatively small amount of money, pirates can convert any hard-copy book into an unprotected text file, even if a legitimate electronic book is never created, Enderle says. "This fear of electronic piracy is actually fueling the piracy movement," he says. That's what happened with Rowling's works. Even though Rowling's publisher, Scholastic Books, doesn't currently offer any Harry Potter titles in e-book format, hackers have scanned all of the books and turned them into PDF files that are viewable on any e-reader. "If electronic books can't be had legitimately, others will step in and fill the need; and once a pirate industry is established, it probably won't go away easily," says Enderle. The best way for the publishing industry to combat piracy is to follow the music industry's lead and make more e-book titles available. Publishers have been producing more digital editions for their books, and revenues are up. Wholesale trade in e-books in the United States for the first three quarters of 2009 ($110 million) is up threefold compared with 2008, according to the International Digital Publishing Forum.